The Nissan e-NV200 is now available as a pure electric seven-seater; despite having zero tailpipe emissions, it’s surprisingly fun to drive. Electric vehicles were seen as the ideal solution to reduce CO2 emissions, but now the world has woken up to the fact that they’re also a key solution in the war against local air pollution – so if you want a seven-seater vehicle for short journeys that has no tailpipe CO2, NOx or particulate emissions, then (this side of a Tesla) the Nissan e-NV200 is the only solution. 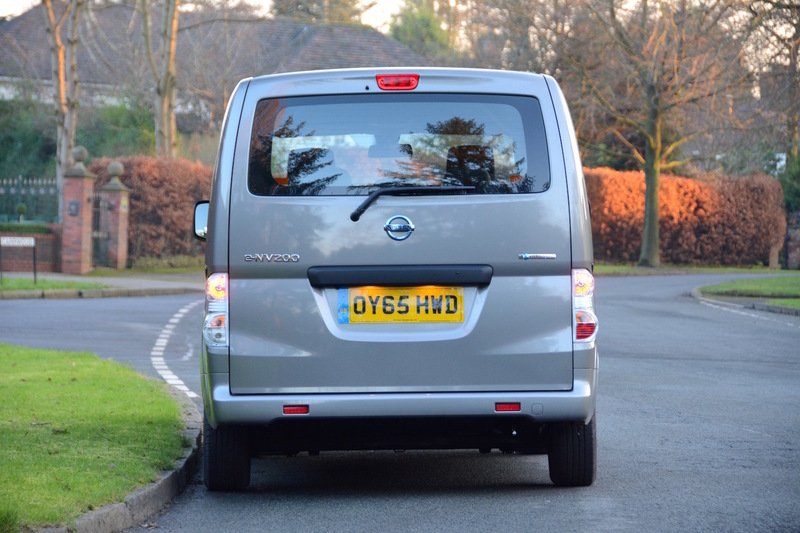 The Nissan e-NV200 comes as a van, a five-seater, or, in the case of our test vehicle, a seven-seater minibus. However if you buy the seven-seater, this can also act as a five-seater, or a van, so it’s a highly flexible vehicle. 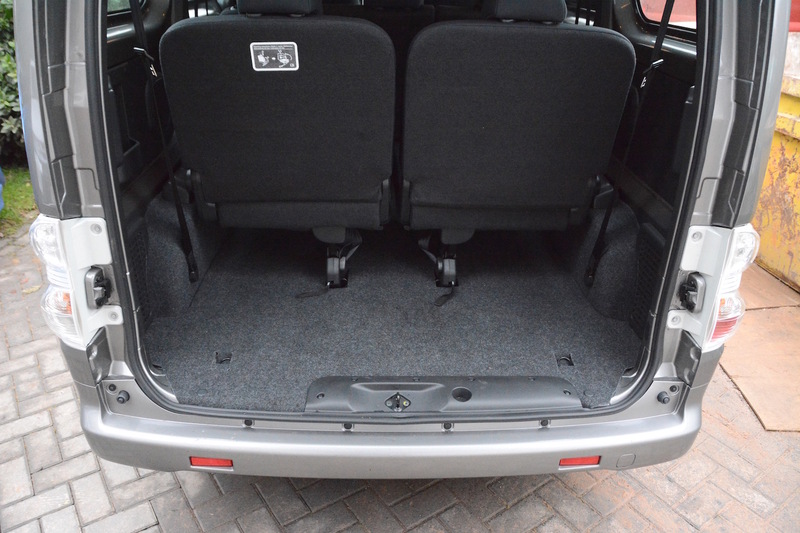 With the two sets of rear seats stowed away, there’s lots of space inside, however compared to most vans, it’s relatively small and narrow on the outside. Under the skin the e-NV200 is based on the familiar Nissan LEAF, with the same powertrain consisting of a lithium-ion battery and an 80 kW AC electric motor. 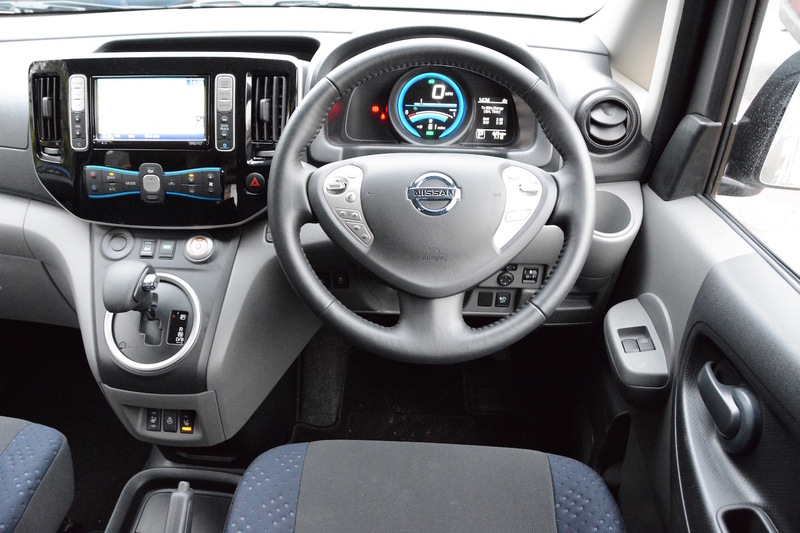 Like the Nissan LEAF, the e-NV200 is easy to drive. It’s automatic and the steering is light. 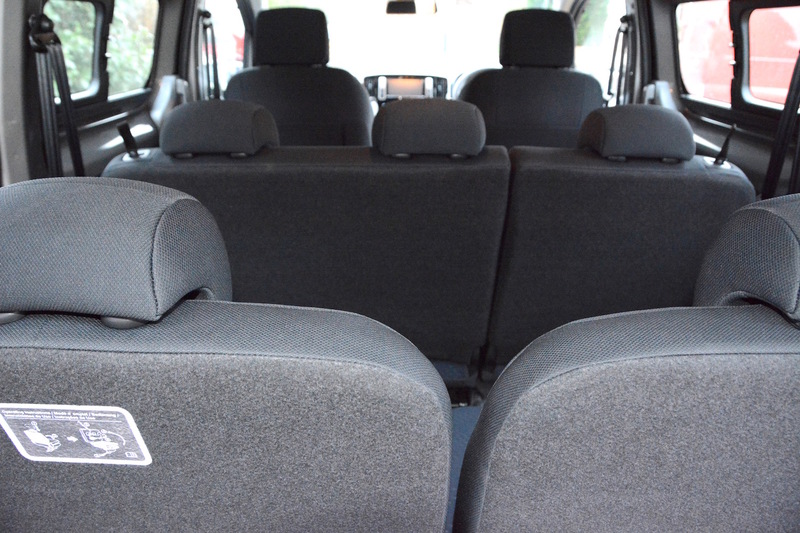 It must be the most refined and quiet seven-seater minibus, and it’s certainly the most refined van on sale. However it’s also fun to drive, and if you’re not careful with your right foot, you can easily end up spinning the wheels if accelerating enthusiastically out of a corner in the wet. Because it’s electric, it offers instant torque during acceleration. It also has a very small turning circle. So for all these reasons it’s ideal for nipping around town – again, like the Nissan LEAF. 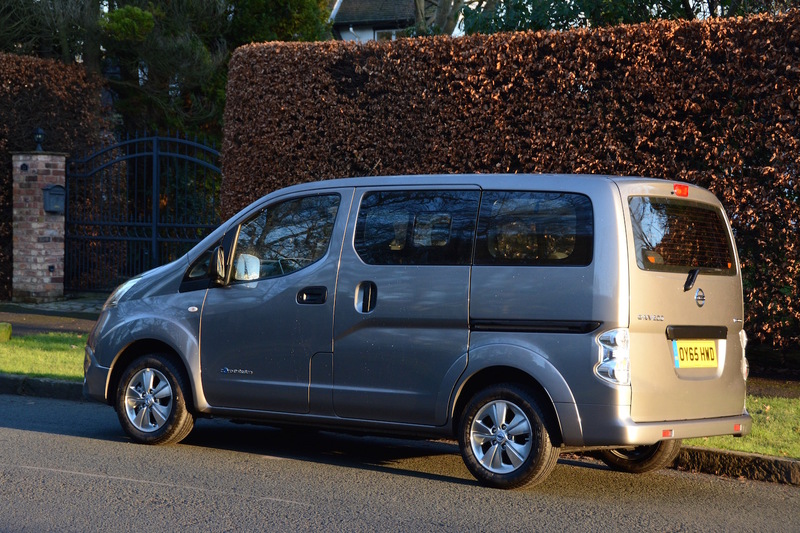 In fact, the e-NV200 is good to drive – much better than you would expect judging by its looks. Although the ride is generally comfortable, when unladen the vehicle can become bouncy over uneven road surfaces. 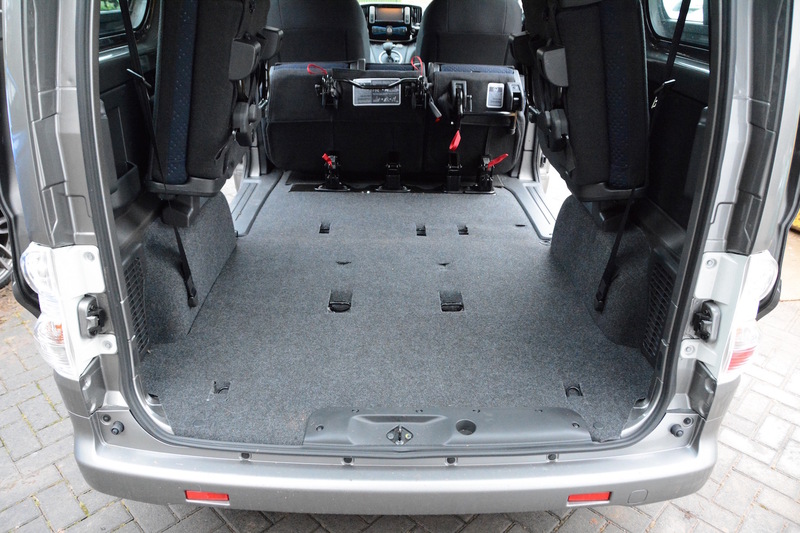 However you need to remember that the e-NV200 is essentially a van, and so there is a very van-like driving position. This is made even worse by the fact that the steering wheel has no reach adjustment. In an effort to find the best compromise for the driving position, the top of the instrument panel – which shows if the indicators are on – can end up being obscured. There’s more fun and games when recharging at night. The release for the charge flap is under the dash right next to the bonnet release catch, and neither are lit at night – the bonnet must get opened in error on many occasions. And a light in the recharging port (at the front of the vehicle behind the Nissan badge) would also be really helpful, as it’s all very dark in there if you’re trying to recharge at night. 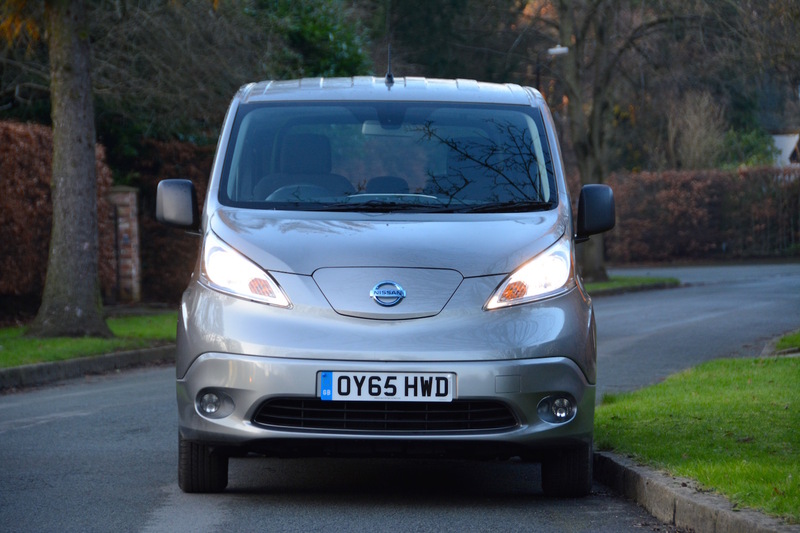 The Nissan e-NV200 has an official NEDC driving range of 106 miles. 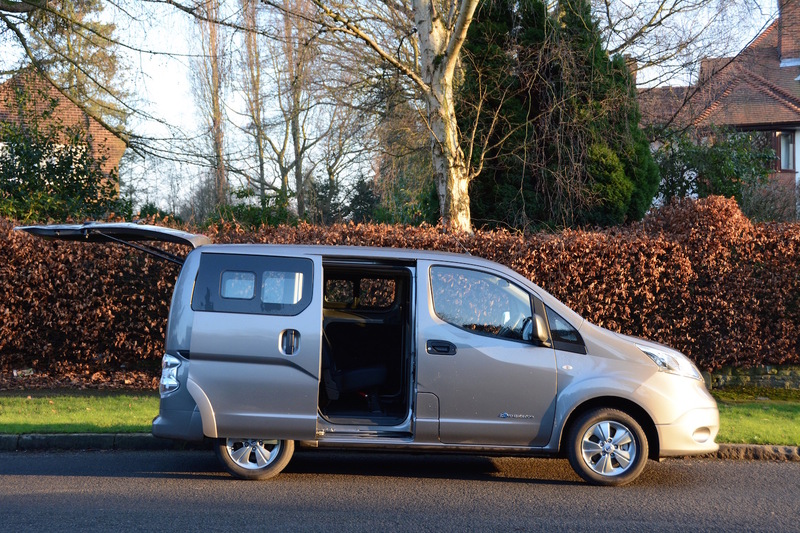 Every e-NV200 that we test seems to be in winter, and in such conditions the real-life range was 68 miles. There are some tricks to eke out more range – there’s an Eco button and you can select more brake regeneration by having the gear selector in the B position. 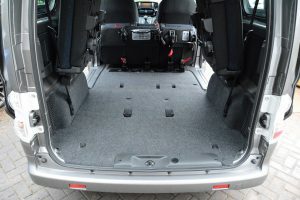 It’s also best to use the heated seats and heated steering wheel rather than try and heat the entire van, which will kill the range. The e-NV200 has a 6.6 kW on-board charger and it should take 4 or 7 hours to fully charge, depending on the chargepoint, although it also has a 50kW rapid charge capability. Apart from the zero tailpipe emissions, the other big advantage of the e-NV200 is that it is very cheap to run. A full charge – providing a range of 60-100 miles – could just cost around £2. The Nissan e-NV200 costs £26,145 plus £5,229 VAT, which totals £31,429 before the government’s plug-in van grant (which offers a grant of 20% up to a total of £8,000), resulting in a price of £26,429. The 7 seat Combi version, as tested, is an extra £316.80, and there’s also the option of the ‘cold pack’ consisting of heated front seats, heated steering wheel, heated door mirrors and electric door mirrors, for £156.00 – both of these options sound very reasonable compared to the cost of options on German premium brands. 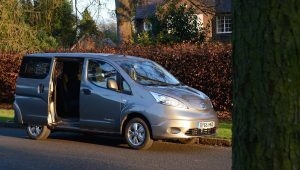 The Nissan e-NV200 has a Benefit-in-Kind rate of just 7%, which could potentially save company car buyers many thousands of pounds per year. 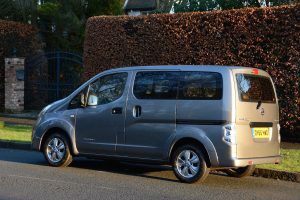 The Nissan e-NV200 is a niche choice, but it has the advantage of being the only option if you want an all-electric seven-seater (unless you want to part with more than £60,000 for a Tesla). With the increased focus on local air quality issues, the e-NV200 should be seen as increasingly relevant for transporting seven people on short journeys in urban areas such as London, where it makes much more sense than a diesel seven-seater. It’s refined and more fun to drive than you might imagine, but the main downside remains the limited range; ideally we think any electric car needs a minimum of 100 miles of real-life driving range. The outcome of all this is that the Nissan e-NV200 gains a Green Car Guide rating of 8 out of 10.